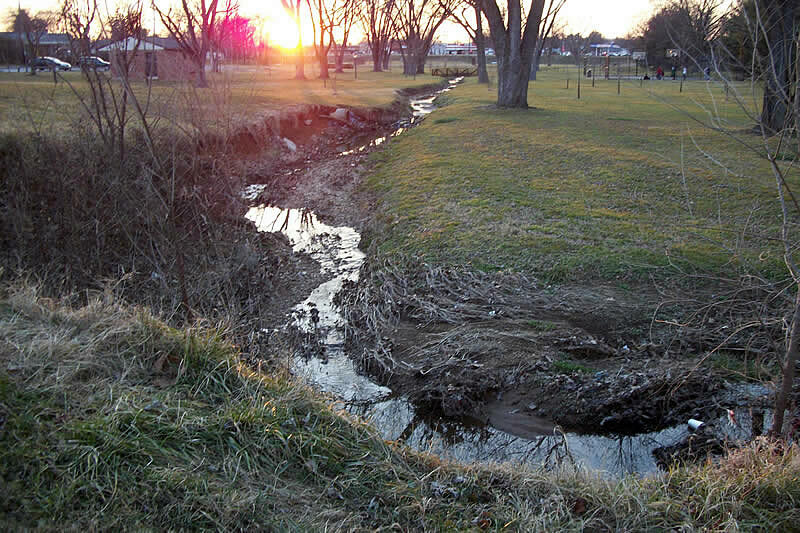 What happens to a stream in an urban area when it is unnamed, unremarkable, unloved? Worse, the 1940’s development around it has resulted in sixty years of storm water runoff flowing into big pipes that drain down to it with no mitigations. Its banks erode and the stream bed falls below the ground level of its natural floodplain. Edges are stripped of vegetation and trash gathers. Sediments wash away and stream life declines precipitously. The man made beginning of the stream. 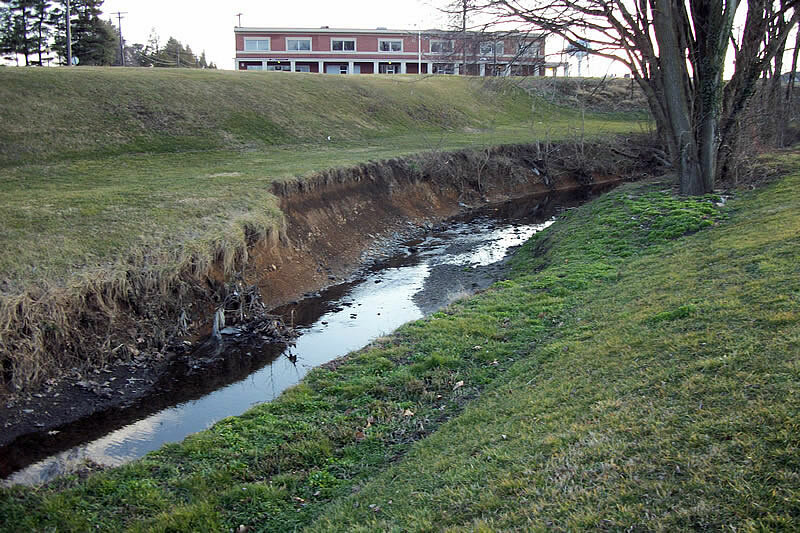 That is what happened to a small stream running through two linear parks in the City of Frederick. It was seen by park users who came for picnics, playgrounds, tennis courts and basketball hoops. The stream actually begins about six blocks farther into the city, underground now, covered by impervious surfaces, and piped back out from under the streets at the park area. It was basically an open ditch for runoff. I had been searching for a way to commemorate my distant ancestor, Abraham Faw, in the City of Frederick, where he made quite a few marks of distinction in business and politics. And at a board meeting of the Monocacy Scenic River Board, a planner from Carroll County brought up the possibility of naming streams through proposal to the U.S. Board on Geographic Names. The better part of a year passed, and then I received official confirmation of the new name's approval by the GNIS in December. Now, instead of an unnamed stream, we had an Abraham Faw Run. Maybe I should've picked a better stream to honor Abraham! From an environmental perspective, the stream was nearly choked out of existence by a variety of factors. First, several blocks leading back to its source, likely a spring, its flow was underground in pipes and undeneath pavements, or impervious surfaces. 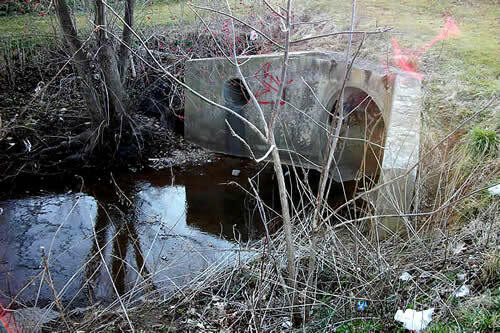 Where it dumped out from under East Street in Frederick, it was a mere trickle during normal weather. It filled parts of its low trenchlike streambed, which was eroded and disconnected from its natural floodplain. Worse, it was the focus of several straight drain pipes and culverts that would shoot enormous quantities of street stormwater into it. There were four or five of these antiquated stormwater pipes within the first stretch of the park. These of course inflict great damage to its course, eroding the banks and deepening the channel cut below the floodplain. But, it felt like having won it a name, the stream needed some improvements, planting trees along it, a sign, something to commemorate the new status. It would benefit the parks too. I had worked the previous year in getting a site approved in Monocacy Village Park to plant a community orchard project, but it had not yet been realized, and needed an administrative body to oversee the efforts. If something were to be done, it was going to be up to me to seek the resources, but then I love a seemingly impossible challenge. So I took this radical idea, this push back against all the forces of poor past development practices, the sometimes seemingly unyielding city bureaucracy, and I started promoting the idea of improving the stream. Thankfully, I had a great, and immediate ally, or two. 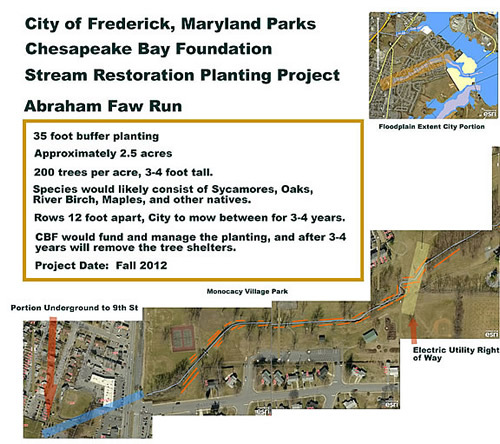 My decade of involvement in Frederick water quality and supply issues had yielded me enough recognition and associations to put out a call and have the Chesapeake Bay Foundation's area restoration biologist respond positively to conducting a riparian buffer planting project along Abraham Faw Run. Quickly, I had a trump card. At no expense or large effort from the City, the planting proposal was supported and funded. If only it was possible to sell it to City Parks as an enhancement. 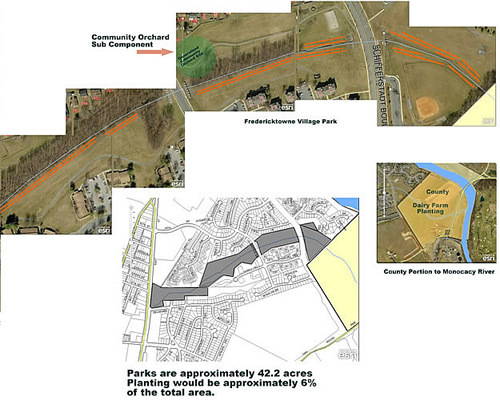 I drafted a mapping and proposal plan and went to the City of Frederick Parks Commission, and won initial approval. Given the progress of some dealings in the City, it was shockingly easy. 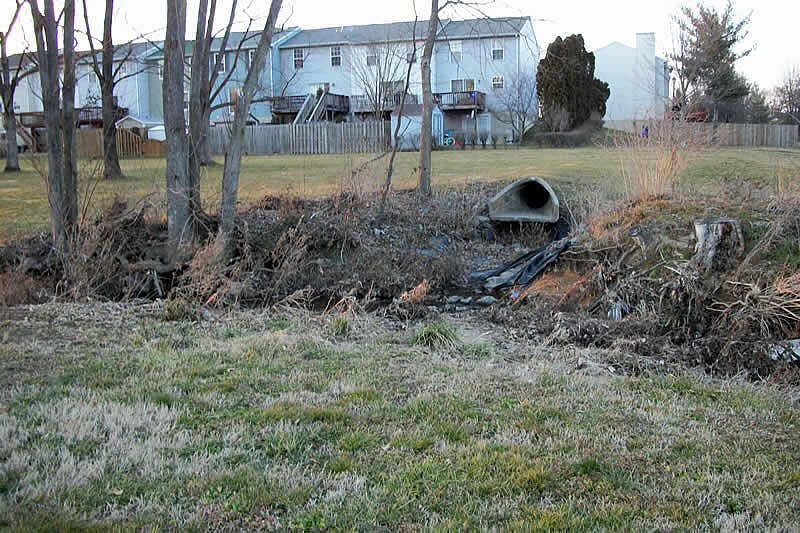 I’m awaiting final details to be worked out, but hopefully we’ll see a Fall planting of thirty-five foot wide tree buffers along the stream from East Street to Schifferstadt Boulevard. About two miles of stream run, and about two acres of plantings. All using only six percent of the two combined forty two acres of the parks. Imagine the change that would occur if this could be repeated a hundred or thousand times over! Do you have a stream, either named or unnamed, that you love, or which needs your help? If you are in the Frederick watershed, then it flows to the Monocacy, on to the Potomac, and down to Chesapeake Bay. Or you can help with the stream buffer planting along Abraham Faw Run, or the Community Orchard planting project. Soon the Monocacy Scenic River Board will be announcing a stream naming project inviting your suggestions for naming a few select streams in Carroll and Frederick counties. The campaign is being called “The Monocacy Starts Here”. Naming a stream adds to its identity, it becomes a place worth caring about – it attaches a human significance. With a name the community attaches itself to the care and concern for the stream, it becomes an asset, not just a ditch to divert stormwater. It has a slight chance to be enhanced and to once again become a full natural resource. Abraham Faw Run will not be completely restored, that would take an amount of effort and money that likely could not be found for many years. But it will be regenerated in part, and even do a better job as a park, and a stormwater mitigation, for us all. And its flow to the Monocacy River, and the Chesapeake Bay, will improve. Not bad for a bit of vocal advocacy, a lot of faith, and a little public audacity. Now if only the next person down the line takes the same steps to save a stream, together we'll keep moving forward.